Exclusive use of three bedroom, two bathroom well appointed house with 12m swimming pool. Two spacious lounge rooms, one with a lofty ceilings, panoramic windows and hinterland views; the other is a cosy retreat with wood-burning stove for cooler evenings. Modern, well equipped kitchen leads to both internal living spaces and also to external dining and lounge deck overlooking Byron Town. Two comfortable double bedrooms on the entry level, and downstairs, a parents’ retreat with king size bed, ensuite bathroom and lounge, alongside the sparking swimming pool. Also on the lower level, a shady patio with table setting, hammock, Balinese garden, small lawn and pool access. Banjo’s is just five minutes walk to the General Store or the Bay Grocer for coffee. Ten minutes to lunch at The Top Shop and fifteen minutes to the town centre. It takes just 20 minutes to walk to the restaurants at the beach end of Jonson Street, the Byron Markets or to Clarkes Beach. Tallows beach is just 15 minutes walk through Arakwal Reserve. Close enough to the action and just far enough to escape from the world. Please Note this property requires a security bond. This property is fully self contained and is not a serviced property. You will need to bring all toiletry items and supply your own washing powder, dish detergent, toilet paper and food. 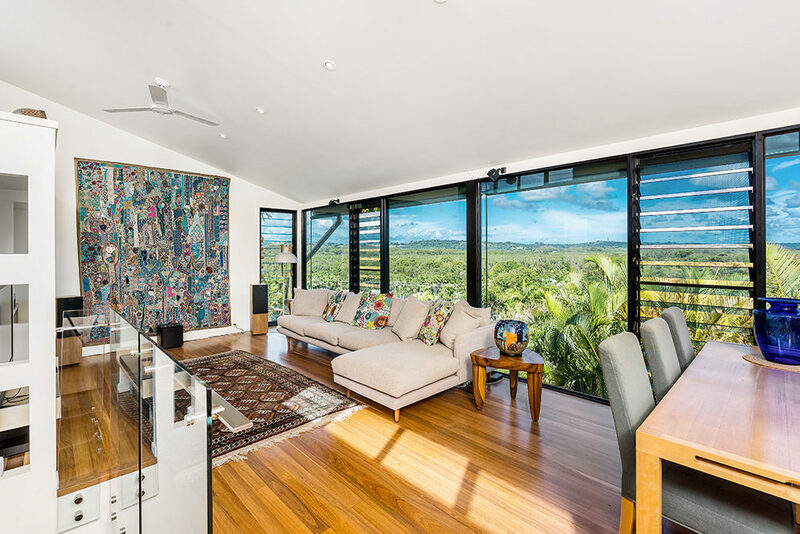 Two spacious lounge rooms: one with a lofty ceilings, panoramic windows and hinterland views; the other is a cosy retreat with wood-burning stove for cooler evenings. Modern, well equipped kitchen leads to both internal living spaces and also to external dining and lounge deck overlooking Byron Town. Banjo’s is just five minutes walk to the General Store or the Bay Grocer for coffee. Ten minutes to lunch at The Top Shop and fifteen minutes to the Mercato Centre and Woolworths. It takes just 20 minutes to walk to the restaurants at the beach end of Jonson Street, the Byron Markets or to Clarkes Beach. Tallows Beach is a short drive away.